In part one you have a short text with eight words missing (an example question ‘0’ is also given). For each gap you have four words to choose from, and you must select the one that fits best. 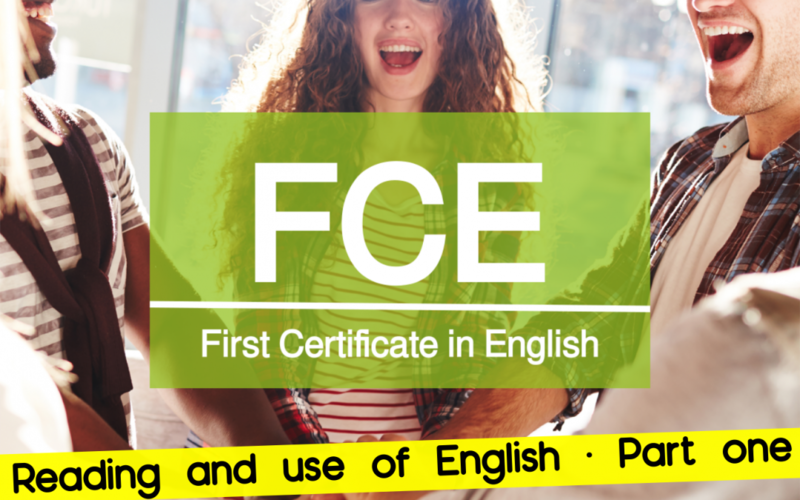 Part one is quite easy compared to the other Reading and Use of English parts so, as explained in the FCE USE OF ENGLISH PAPER article, it is better to leave this part until the end. Instead, it is advisable to start with the sections that ask you to write words, leaving the multiple choice questions until later. Introduction. Part one is a short text with eight multiple choice questions. There are four options (A -D) for each question and you have to decide which is the correct answer. How many marks are there? Each question carries one mark. What does part one test? Vocabulary, idioms, collocations (two or more words that often go together. These combinations just sound “right” to native English speakers) phrasal verbs, linking words, synonyms, fixed phrases, etc. Should I answer all the questions? You will not lose marks if you give an incorrect answer so always choose one the four options given. Reading for the gist. Read the text quickly once to get the general idea. Look at the text before and after the gap. Predict the answer. Think of the type of word you need (noun, adverb, adjective, etc.). Look for grammar and content clues. Try to identify the words around the gap that can help you guess the right option. Pay attention to what come before and after the gap. Once you choose your option, make sure it matches with the rest of the sentence (e.g. verb plus preposition). There is always only one correct option. Even if the four options look very similar, there is only one word which fits grammatically and has the right meaning. Use the process of elimination when possible to increase your chances of answering correctly. If you don’t know the answer, get rid of the options that you’re sure are wrong so you can choose between those that are left. You need to ask yourself both “Which is it?” and “Which isn’t it?”. Read the full sentence. After you choose one of the options, read the full sentence to see if it makes sense. Time management. Don’t waste time. If you don’t know an answer, leave it and come back later. Read, read and read! You need to demonstrate that you can deal confidently with different types of text, such as fiction, newspapers and magazines. Learn whole phrases as well as individual words in context. Knowing the grammatical patterns and collocations of words is as important as knowing their meaning. Learn from your mistakes. Look back at any possible error and revise the relevant grammar. In the next article we will put our tips into practice with the following text. En la parte uno tienes un rellena huecos de 8 palabras (se te dará un ejemplo tipo ‘0’). Para cada hueco tendrás cuatro palabras entre las que elegir y deberás escoger aquella que encaje mejor. La parte uno es bastante fácil si la comparas con las otras de Reading and Use of English, así que, tal y como se explicaba en el artículo FCE USE OF ENGLISH es mejor dejar esta parte para el final. En su lugar, es aconsejable, comenzar por las secciones que te preguntan por escribir palabras, y dejar así la respuesta múltiple para más tarde. Introducción. La parte uno es un texto breve con ocho respuestas de elección múltiple. Hay cuatro opciones (A -D) para cada cuestión, y debes decidir cuál es la respuesta correcta. Puntuación. Cada pregunta conlleva un punto. ¿Qué se pone a prueba en la primera parte? Vocabulario, expresiones, colocaciones (decimos vino tinto y no vino rojo, aunque se entiende, no resulta natural), ‘phrasal verbs’, palabras relacionadas, sinónimos, frases fijadas, etc. ¿Debo contestar a todas las preguntas? No descuentan puntos si das una respuesta incorrecta, así que escoge siempre una de las cuatro opciones. Leer para captar la esencia. Lee el texto rápidamente una vez para obtener una idea general. Mira el texto que tienes delante y detrás del hueco. Predice la respuesta. Piensa en el tipo de palabra que necesitas (sustantivo, adverbio, adjetivo, etc.). Solo hay una opción correcta. Incluso si las cuatro opciones parecen muy similares, solo hay una palabra que encaja gramaticalmente y que tiene el significado correcto. Usa el método del descarte para aumentar tus posibilidades de responder correctamente. Si no sabes la respuesta, deshazte de las opciones de las que estás seguro que son incorrectas, de esta manera puedes elegir entre las sobrantes. Lee la frase completa. Tras haber elegido una de las opciones, lee la frase completa para comprobar que tiene sentido. Gestión del tiempo. No malgastes tu tiempo. Si no sabes la respuesta, déjalo y vuelve más tarde. ¡Lee, lee y lee! Necesitas demostrar que puedes manejar con seguridad diferentes tipos de texto, como ficción, periódicos y revistas. Aprende frases completas y palabras sueltas en contexto. Conocer los patrones gramaticales y las colocaciones de palabras es tan importante como conocer su significado. Aprende de tus errores. Si tienes dudas revisa la gramática más relevante aunque sea de niveles más bajos. En el próximo artículo pondremos en práctica nuestros consejos con el siguiente texto.